From 1961 to 1967 Southern Palace Theatre was simply known as just the Amphitheater. It was an outdoor venue that produced live shows throughout the season. For the 1968 season, Six Flags Over Texas transformed the Amphitheater into an indoor performance venue with a proscenium-style stage. This is likely due to the Texas heat that can be brutal during the summer months. 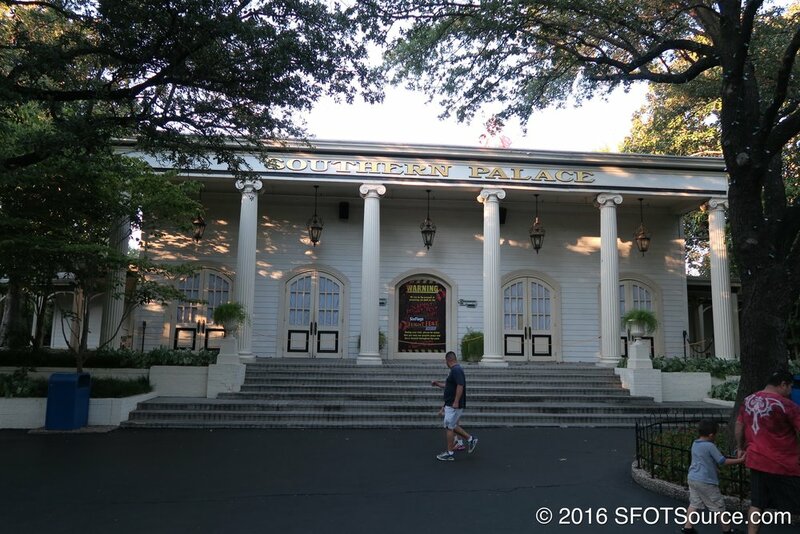 The seating structure from the Amphitheater to Southern Palace Theatre is actually the same. Today, the seating structure has been carpeted. When the park transformed Amphitheater into Southern Palace Theatre they had to build the theatre’s structure around one of AstroLift’s supports. Many old pictures show the AstroLift structure sticking out of the top of Southern Palace.